Properties in Stearns Pond average 4.7 out of 5 stars. Additional fees apply.Taxes may be added. Charming Waterfront Cabin with Mountain View and Private Beach Access! Property 4: Charming Waterfront Cabin with Mountain View and Private Beach Access! Picture Perfect Cabin with a Private Dock. NOW WITH WIFI! Property 6: Picture Perfect Cabin with a Private Dock. NOW WITH WIFI! Ski, Swim, Kayak, Fish, Hike-all Season Nature Lovers Location! Property 13: Ski, Swim, Kayak, Fish, Hike-all Season Nature Lovers Location! Summer! Private Maine Cottage with Hiking, Swimming, and Seasonal Activities! Property 15: Summer! Private Maine Cottage with Hiking, Swimming, and Seasonal Activities! 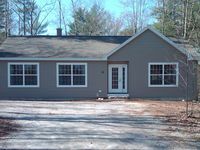 WELCOME Spring & Summer - Bridgton Bungalow Cottage - Bring Fido - Pet-Friendly! 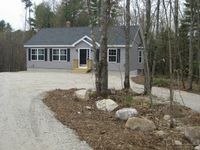 Property 19: WELCOME Spring & Summer - Bridgton Bungalow Cottage - Bring Fido - Pet-Friendly! Fryeburg Riverfront Retreat on the popular Saco River and Snowmobile trails! Property 20: Fryeburg Riverfront Retreat on the popular Saco River and Snowmobile trails! Spacious 4 Bedroom Home ~ Moose Pond/ Shawnee Peak. Your Kids Will Love It Here! Property 22: Spacious 4 Bedroom Home ~ Moose Pond/ Shawnee Peak. Your Kids Will Love It Here! Swim, Kayak, lawn games. Walk to ice cream. Live Theatre , firepit smores! Property 24: Swim, Kayak, lawn games. Walk to ice cream. Live Theatre , firepit smores! Adorable cottage set among tall pines with sandy beach a half mile from town. Property 25: Adorable cottage set among tall pines with sandy beach a half mile from town. Look out the windows at the mountain fall foliage, close to N. Conway. Property 31: Look out the windows at the mountain fall foliage, close to N. Conway. Great find! This property is usually booked. Private home w/ deck, game room, HOA pool & beach - near Shawnee Peak slopes! Property 35: Private home w/ deck, game room, HOA pool & beach - near Shawnee Peak slopes! NEW LISTING! Lovely, new construction home on 100 acres w/ high-end appliances! Property 36: NEW LISTING! Lovely, new construction home on 100 acres w/ high-end appliances! Traditional Maine cabin located on McWain Pond, Waterford Maine! Property 38: Traditional Maine cabin located on McWain Pond, Waterford Maine! 5 STAR Magical Waterfront Cabin on Papoose Pond! 25 Minutes to Sunday River. Property 44: 5 STAR Magical Waterfront Cabin on Papoose Pond! 25 Minutes to Sunday River. Spacious waterfront chalet w/ cozy wood stove, outdoor firepit, grill, & more! Property 45: Spacious waterfront chalet w/ cozy wood stove, outdoor firepit, grill, & more! This was our second stay in this comfy house. As before, we appreciated the kitchen, the seating, and the mattresses. Since it is almost mud season, it was a challenge not to track sand from the front yard all over the house, and a lot of sweeping was needed. Besides that small inconvenience, we had a wonderful time and discovererd/dined at the nearby excellent Oxford House Inn several times. Clean house/perfect size, and LOCATION!!!! This house was very clean and comfortable. We had 6 adults for our stay and was the perfect size. The location of the house was EXCELLENT! 15 minutes from N. Conway. Snowmobile trails right outside the front door and a fire pit in the back yard. All of this is right on the Saco River too! My family and I can't wait to come back this summer, then winter, etc. Lol. I highly recommend this place for any vacation need.